Jebel Hafeet (Arabic: جبل حفيت‎) (variously translated Jabal, Jabel and Jebal) is a mountain primarily in the United Arab Emirates on the outskirts of Al Ain. The mountain actually straddles part of the border with Oman. The mountain rises 1240 meters and offers an impressive view over the city. Jebel Hafeet was a well-known landmark throughout the area's history and is a contemporary tourist attraction. 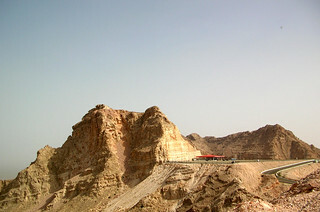 An extensive natural cave system winds through Jebel Hafeet. This work by Rhonda Surman is licensed under a Creative Commons Attribution-NonCommercial-NoDerivs 3.0 Unported License.